Plastic surgery may be nothing new in the world of celebrity, but there now appears to be a shocking rise in the number of young stars dramatically transforming their looks with facial fillers. Geordie Shore star Chloe Ferry was just 19 when she first joined the reality show in 2014 and started plumping her face with fillers just one year later – to the horror of many fans. But the filler craze isn’t confined to the world of celebrity, Closer’s Dr Christian Jessen says “There’s been a huge rise in the number of young girls seeking out the procedure to emulate their favourite reality stars. Ashton Collins, from Save Face, an organisation that has developed a register of safe practitioners in the UK – tells Closer, Non-surgical cosmetic treatments generate over £2.75 billion in the UK, yet the sector is almost entirely unregulated. Legally non-surgical treatments such as fillers can be provided by anyone and practitioners aren’t required to have any qualifications – medical or otherwise. In the past 12 months, we’ve received an alarming increase in the number of reports regarding procedures gone wrong and rogue practitioners. The most common complains are unsightly lumps, painful swelling and infection. Figures have almost trebled in comparison to the previous year with a total of 934. Over 83 per cent of the reports we’ve received were of treatments administered by non-healthcare professionals like beauticians and hairdressers. A huge 30 per cent of complaints we received were related to procedures being performed by people who had set themselves up with no relevant training and were believed to be purchasing products, such as dermal fillers – sometimes made of saline or even silicone – on the internet. There’s no law preventing this, either. These people are often not trained on how to deal with someone having a bad or allergic reaction to the filler, or if they go into anaphylactic shock. And we’ve found if people do suffer adverse reactions and need medical attention, these businesses often shut down and disappear – leaving the girls with no aftercare”. 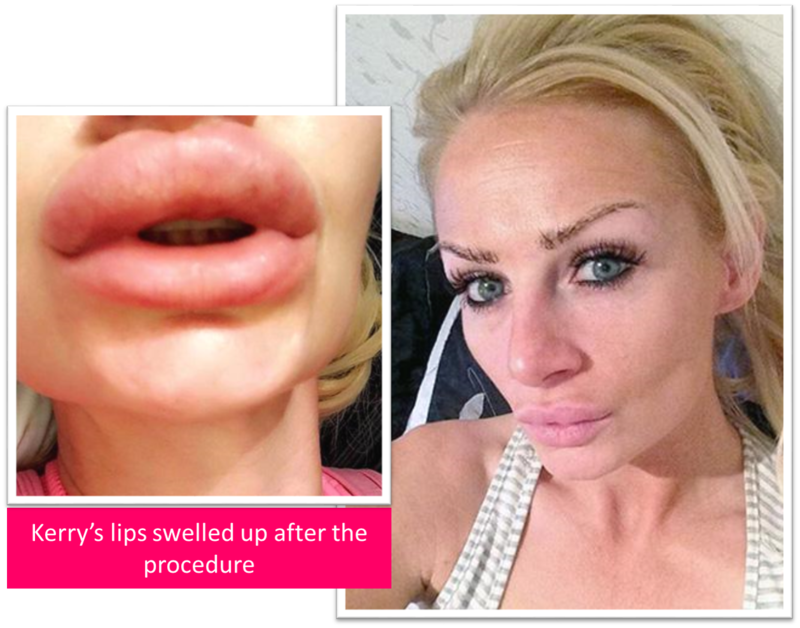 Model Kerry Miles was horrified when dodgy filler – which she now suspect was actually baby oil – left her lips swollen, and resembling raw meat. Now she’s urging women to think carefully before going under the needle and to research practitioners thoroughly. Kerry wanted plumper lips to give her a more youthful appearance. She explains “I just picked the first clinic that popped up on Google. It had good reviews, and the practitioner said she had 14 years of experience. But when I got there, it was a rundown house, and there was just a collapsible grubby-looking bed in the conservatory. There was even a dog running around. 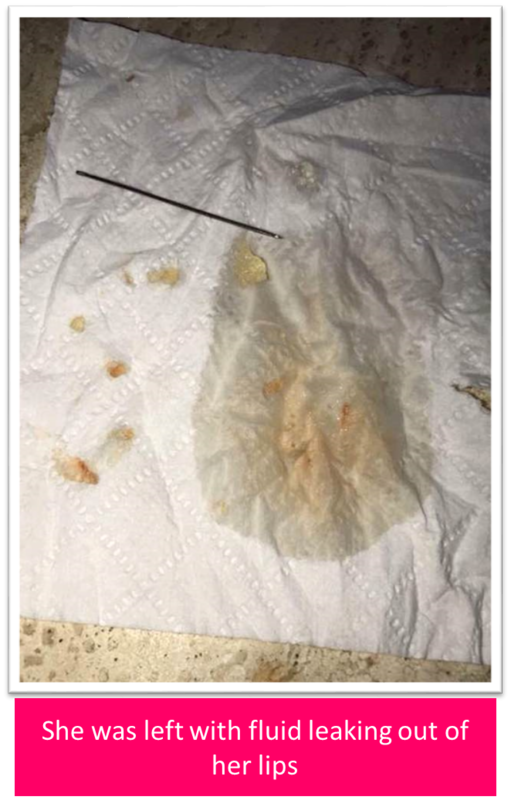 The woman wiped my lips with a baby wipe, and mixed the filler up in a bowl, before injecting it into my lips. Looking back, I should have run out of there, but I didn’t know any better”. Since then, Kerry has spent years trying to correct the damage. She explains, “It’s been a nightmare. I’ve had more filler, to try and hide the lumps and bumps I was left with, but it didn’t work. In the end I had to have all the filler removed. It didn’t dissolve like a normal filler because it was a mixture of substances and was injected incorrectly. “When it was taken out, I was told that the filler appeared to have been mixed with some kind of baby oil. I couldn’t believe it.” But incredibly the horrific experience hasn’t put Kerry – who’s also had Botox, vampire face lifts and a nose job – off having lip fillers again. If you are still determined to have fillers. Save Face advises you look at their list of registered practitioners first. They ensure their practitioners are licensed medical professionals – who are able to manage any complications from the procedure and won’t leave patients in the dark regarding aftercare. They ensure the products the practitioners are using are licensed for the treatment, both are safe and effective, and that the clinic is hygienic to minimise risk of infection.